Transition metals are the d-block of the periodic table and therefore have unfilled d-orbitals in common oxidation states. Technically, zinc, cadmium and mercury aren’t transition metals, as they have full d-orbitals, they are generally included anyway. Scandium, the first of the transition metals has the configuration [Ar]4s23d1, (remember that the 4s fills before the 3d), and you continue along the period, adding in one electron to the d shell as you go. There are, however, two exceptions. Chromium: [Ar]4s13d5 and copper: [Ar]4s13d10, as the half filled and fully filled d shells are more stable than a full 4s shell. Transition metals all have high melting and boiling points, though some are higher than others. The melting/boiling point is related to the strength of the metallic bonding, which is determined by the number of unpaired d electrons. The first 5 elements have increasing numbers of unpaired bonds, but they start to pair up after that. The first electrons to be knocked out of a transition metal tend to be the s orbital ones, so the 2+ oxidation state is common across the board, (with a few exceptions). The maximum oxidation state possible is equal to the number of s and d electrons present in the valence shell up to iron, and then decreases after that. 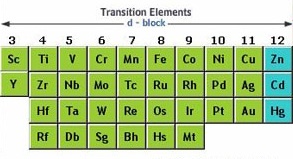 Most transition metals have many oxidation states, due to all the different arrangements the d electrons can take.